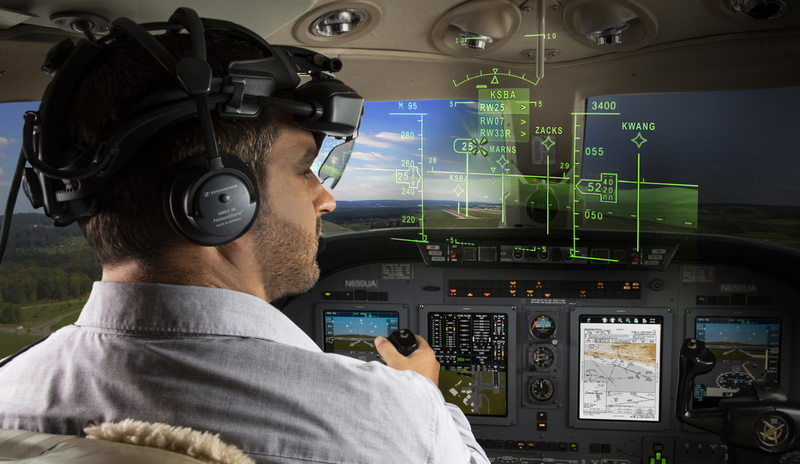 Orlando, FL - October 16, 2018 – Universal Avionics (UA) is unveiling a new 'Head-Up, Head-Down' flight deck system during NBAA-BACE 2018 with the integration of the InSight™ Display System and Elbit System's SkyLens™ wearable Head-Up Display (HUD). UA CEO Paul DeHerrera and Elbit System's VP of Commercial Aviation, Dror Yahav, will present the new future flight deck concept with live demonstration during an in-booth (#2268) press gathering and reception on Tuesday, October 16th from 3-6pm EDT. Displays all Flight Management System (FMS) information super-positioned on the real world, allowing for a better understanding of navigation data. Provides an enhanced, more intuitive user interface – look, point, and click. Reduces workload in critical flight phases by allowing the operator to program the FMS looking out the window while flying the aircraft. Offers the first step to support single pilot operation. Presents a wearable HUD to the retrofit market. "'Head-up, head-down' technologies have of course been integrated before in various business jet platforms," said Dror Yahav. "The integration of UA's InSight and Elbit Systems' SkyLens takes this technology into a new level of functionality which the market has never seen before," he added. "Leveraging the fact that these two systems are now owned by the same design house and company enables us to bring the Augmented Reality (AR) trend into the aviation world so operators can receive full flight management information generated by the FMS, superimposed on the real world. The operator can control the avionics by 'look and select' while maintaining his/her complete attention looking out of the window. The integration also allows for improved performance with a significant reduction of workload, better single pilot operation, and a new level of safety and operational effectiveness." SkyLens and InSight are both critical components for safety in today's aircraft and reliance on them by the operator varies during phase of flight. During the enroute phase, the operator is most likely to monitor and rely on InSight (head-down). While in the approach to landing phase, past the initial approach fix, SkyLens becomes key. Combining these two technologies enables the operator to have the key information required, precisely when it's needed, all presented super-positioned on the real world. The new key functionality which will be demonstrated during NBAA-BACE, has the ability to control the FMS and flight deck with the pilot's sight, using the point and click capability. This allows the pilot to program and update flight path, runway selected and other critical FMS commands during critical approach phases, without distracting attention from flying the airplane head-up. The fully integrated function allows change of runway selected, approach selected and waypoint programing, all by looking on a virtually presented flight path and point selection with sight. After the Final Approach Fix (FAF), SkyLens provides valuable assistance beyond the standard head-up information and symbology such as the ability to see the runway in low visibility and at night using the company's Enhanced Vision System (EVS) camera. The system aligns with the most updated ruling released by FAA FAR 91.176, enabling the pilot to perform a full landing procedure with no natural vision. Once on the ground, SkyLens can assist and guide the aircraft to the gate in poor conditions. "The combination of these technologies provides existing operators with added utility and capabilities that were never envisioned during the original type design of the aircraft they were operating," said Paul DeHerrera. "Many flight decks cannot accommodate a 'traditional HUD' system due to space restrictions and cost," he added. "InSight/SkyLens provides a retrofit path to thousands of operators improving reliability, safety, and situational awareness during all phases of flight and taxi. The wearable HUD technology of SkyLens integrated with the latest generation flight display system of InSight brings two of the most advanced technologies together, operating in harmony across the various phases of flight. Bringing these new technologies together for the first time, making them available to both retrofit and forward fit customers is game changing." Rather than buying a new aircraft to gain access to state-of-the-art functionality, operators now have an available upgrade solution. UA/Elbit Systems is the only company with a commercial offering of a wearable HUD technology in the market today. Operators can count on UA's long history, experience, and know-how in certification and support in the aftermarket to compliment this great offering.